In the last Machine Monday blog, we discussed how the Eagle NX Hip Abduction Adduction machine helps work the thighs and hips. With this Machine Monday blog, we will look at the Eagle NX Abdominal which is another piece of equipment which has great interest among our fans. We will examine how the Eagle Abdominal machine can help strengthen the abdominal muscle group as well as the oblique muscles which surround it. 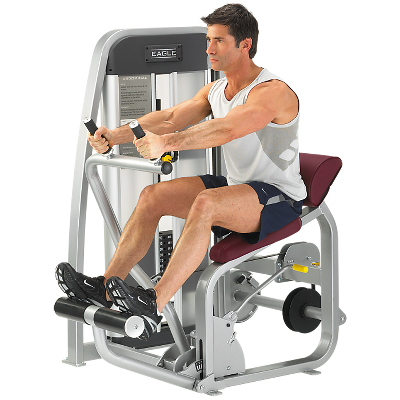 The Cybex Eagle NX Abdominal machine is unique due to its ease of use and its ability to limit over flexing of the spine. While many abdominal machines encourage the user to lift their thighs during the course of the exercise, the Eagle Abdominal stabilizes the pelvic region and minimizes the effect on the hip flexors, arms and shoulders. Rather, users of the Eagle Abdominal keep their arms straight thus preventing stress on arms and shoulders.. Furthermore, the Eagle Abdominal also allows the user to focus on the oblique muscles by using the machine with one arm at a time without having to twist and flex the spine at the same time – which is very stressful. The abdominal muscles, colloquially referred to as the abs or six-pack, along with the obliques are commonly thought of as key components of the core muscle group. They are important to athletes and non-athletes alike. Anytime one sits up or turns to the side, these muscle groups are being used. All athletes need core stabilization and trunk mobility to propel their bodies. This includes tennis players who need the obliques to help serve a tennis ball and football players who need to twist and rotate while throwing, catching or weaving down the field. Want to see how to put these facts to work? Here are three unique exercises which can be used to exercise the abdominal and oblique muscles. NEUTRAL HIP TRUNK CURL: this exercise engages the rectus abdominus muscles as does the standard trunk curl discussed in (1) above. The neutral curl however has the added advantage of providing a more challenging workout. Warning: Use caution when performing this exercise on the Eage Abdominal as there is no predefined bar or option to assist in performing this exercise. SINGLE ARM TRUNK CURL: this exercise engages the internal and external oblique muscles which rest on either side of the rectus abdominus. Next time you are looking for a new way to exercise your abdominal and oblique muscles, you should definitely give the Eagle Abdominal machine a try. You can further see these techniques demonstrated My Cybex Coach.